1.Prioritize Your Plants-First, determine which plants are most susceptible to water stress. High on your watering list should be plants that are valuable in terms of replacement cost, prominence in the landscape and enjoyment. High Priority- trees and shrubs (especially those that are young and planted in an exposed site). Large, mature shade trees and shrubs can be left alone unless the drought is severe and the trees begin to wilt, or the root systems have been recently disturbed. Medium to high priority- perennials, fruit and nut trees, small fruits and vegetables; turf that is less than one-year old. 2. 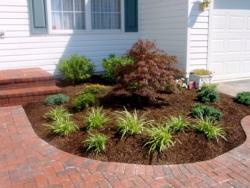 Apply 3-4” of mulch around plants to keep weeds down, conserve soil moisture and moderate soil temperatures. Make sure the mulch is 3-4” away from the trunk/stem of the plant to prevent rot. Mulching minimizes evaporation of water from the soil surface, reducing irrigation need by around 50%. 3. Control weeds around shrubs, vegetables and flowers. Weeds can out-compete cultivated garden plants for water and nutrients. 4. If purchasing new plants, research those that are low water users. All plants require water to become established (CA Natives included) but there are some that are bigger water guzzlers than others. 5. When possible, add organic matter (compost) to your soil. This will improve the water-holding capacity during dry weather and promote good drainage during wet weather. 6. Irrigate early in the morning. Less water loss occurs from evaporation and wind drift in the morning because of cooler temperatures and less wind. 7. 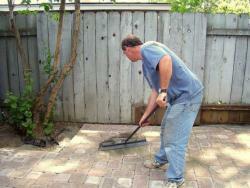 Use a broom to clean driveways, sidewalks and steps. Using a hose to push around a few leaves and scraps of paper can waste hundreds of gallons of water. 8. Don't fertilize or, if you do, do so with a low nitrogen fertilizer. Fertilization stimulates growth and increases water needs. 9. The type of soil you have largely determines how often you should water: Clay soils may only need to be watered once during a given period while sandy soils may need two or three waterings during the same time. 10. Avoid runoff and puddling by spacing out, or cycling, irrigations. Let the sprinklers run for 10 minutes then shut them off for 10 minutes, allowing the water to absorb into the ground. Please click on the links below for more information related to that subject. Low Water Lawns - Helpful tips and websites related to watering your lawn and conserving water. Contains information on lawn removal and lawn alternatives. Low Water Use Landscapes - Tools and websites to help you create a landscape that conserves water. Irrigation in the Landscape - Websites and resources on sprinkler and drip irrigation in the home landscape. CA Department of Water Resources -The Department of Water Resources (DWR) is responsible for managing and protecting California’s water. 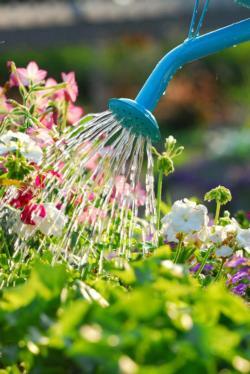 Save Our H20 - Water conservation and drip irrigation basics, installing or upgrading your system, irrigation manuals. Find a Qualified Water Efficient Landscaper in your area. 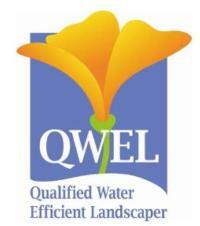 Trained in water-wise landscape practices including plant selection, irrigation system design and water management, a QWEL graduate will help meet your landscape needs while keeping your outdoor water use in check.